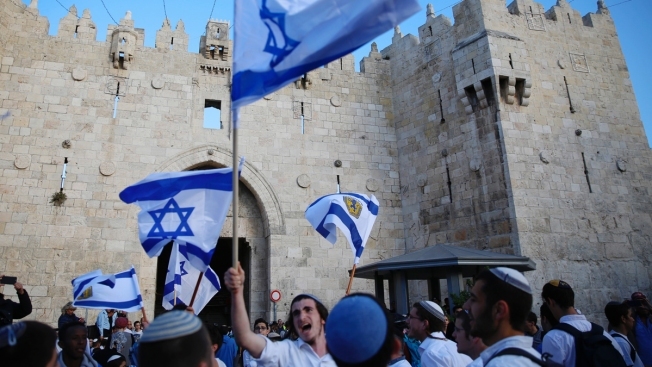 In this Sunday, May 13, 2018, file photo, Israelis wave national flags outside the Old City's Damascus Gate, in Jerusalem. Israel's parliament has approved a controversial piece of legislation that defines the country as the nation-state of the Jewish people. Opponents and rights groups have criticized the legislation, warning that it will sideline minorities such as the country's Arabs. Israel's parliament approved a controversial piece of legislation on Thursday that defines the country as the nation-state of the Jewish people but which critics warn sidelines minorities.